For the tenth year in a row, Oregon has ranked among the top 10 energy efficient states in the country by the American Council for an Energy-Efficient Economy! In a tough field, Oregon ranks #7, down from last year’s #5 spot. Our neighbor to the north, Washington, is just behind us at #8, and our neighbor to the South, California, tied for the #1 spot this year with Massachusetts. Every other year, ACEEE also ranks the largest U.S. cities. This year, Portland landed in the top 10, with a #8 rank among 51 cities. As the state’s Department of Energy, we’re proud to support policies and programs that focus on energy efficiency. ACEEE’s 2016 Oregon report shows how the state leads by example with our State Energy Efficiency Design (SEED) program for public buildings; with our public fleet policies for efficient, electric, or hybrid vehicles; and through many of the services we provide, including connecting agencies, schools, and municipalities with Energy Savings Performance Contractors that offer energy efficiency guidance. Moving forward, Oregon will need to implement new, cutting-edge strategies and programs to advance in the top of ACEEE’s field. We think we’re up to the challenge! 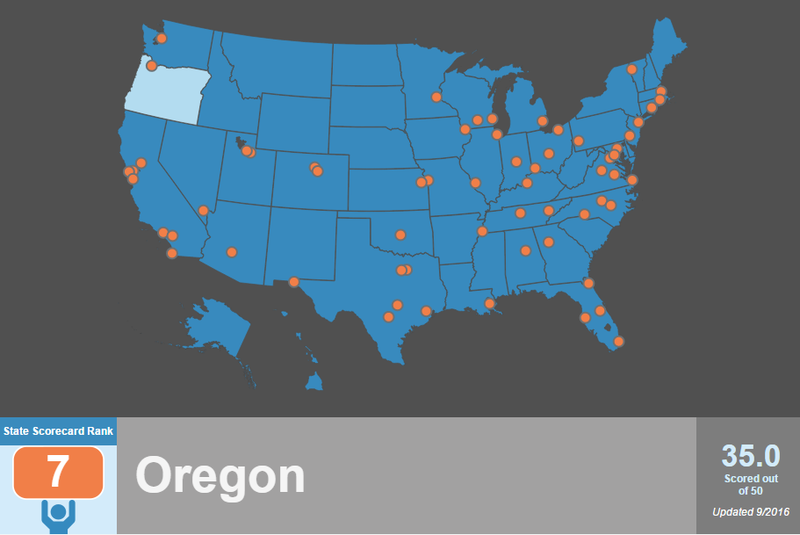 Read more about ACEEE’s State Energy Efficiency Scorecard, and read Oregon’s ranked report.